Read below the happy stories for the animals we've rescued over the years. If you are one of Cat Rescue Network's adopters, you know we love updates and pictures so send them our way and we'll add them to our list of success stories! Meet Brooke, a lovely little British Blue Shorthair. Brooke was destined to be taken to a shelter when her previous family could no longer keep her. She was eleven years old and quite shy, so I knew she would not have much of a chance in a shelter, so I agreed to foster her. I have five cats of my own and after a short time it became apparent that Brooke did not do well with other cats. Two of the male cats were quite dominant and she was visibly afraid of them. Given Brooke’s age I realized that this lovely little girl would be with me for a long time so a solution had to be found to reduce her stress level. With no spare rooms in the house it would not be easy. But there’s always a solution for every problem. My bedroom which is right off the living room was the only room I could make secure for her. I wanted to give her as much space as possible so I cut a hole in the wall to my office and “Brooke’s suite” was created. With two rooms complete with cat tree, three window seats, TV and a large queen size bed, she was just fine. I put a screen door on the bedroom so she would feel secure but not isolated. This set up was ideal for Brooke but my other cats were not amused that they could no longer sleep on the bed or climb up in front of the computer screen and watch me type. 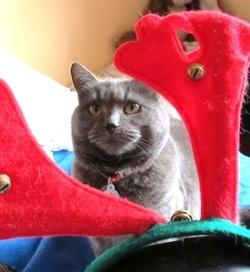 But they had the rest of the house plus the cat run so they were doing OK.
Brooke was on the Cat Rescue Network website for almost two years without any interest; then a week before Christmas someone enquired about her and wanted to come see her. I could hardly believe it. The woman specifically wanted an older cat. Her previous cat lived to be 20 plus years, so 12 did not appear old to her. She came to visit Brooke and immediately fell in love. Brooke was wonderful with her and you could see it was a match made in heaven. She seemed liked a lovely person and a visit to her house confirmed that Brooke had indeed found her purr-fect forever home. I had become very attached to Brooke so it was a bitter sweet moment when she left with her new mum on Christmas Eve morning. I shed happy-sad tears as I waved goodbye to this lovely little girl, but I knew that it was the best Christmas gift I, Brooke and her new mum could have wished for. “Brooke is doing well and I just love her. She has her established favourite places well defined now; on a chair by the living room window and on a chair under the dining room table. She investigates the basement occasionally, but mostly when I am down there too, doing laundry etc. Then, she runs around the full room! It's quite funny to watch. She's become quite vocal, mewing loudly when I come home from work and when she wants to play if I am being lazy on the sofa. She is still shy when other people come by, but she has taken to one friend very well. He is a big cat person and didn't give up on their first meeting until she allowed him to pet her head. She then warmed to him for the rest of the visit and stayed with us all evening in the living room. She loves it when I put a fire log on, and sits on a footstool near it watching it until she dozes off. She is a beautiful little cat, and I had really almost forgotten how wonderful it is to have a pet in the house. So, I thank you very much." I still miss little Brooke but I’m very happy for her and I’m glad I was a part of her life, if only for a short time. We got a call about Isabelle from a woman who had noticed her living in a shed in her neighborhood. She heard that the shed was going to be torn down and she had also noticed that Isabelle was often being chased by the other stray cats in the area. When this woman would put food out for them, Isabelle would be the last one to eat - if she was lucky. When it was clear that Isabelle was pregnant the woman called us. Within days, we had Isabelle safely tucked away in foster care (see a picture of her first night, top, below). Severly malnourished, she was thrilled to have food and water and a soft bed to sleep in. 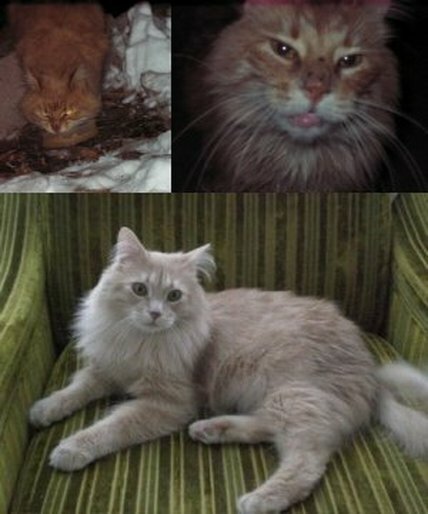 Turns out, we had arrived just in the nick of time and she had three kittens shortly after (see below, bottom photo). Isabelle raised these three healthy kittens (see above photo) in the safety and security of her foster home and couldn't have been a better mom. All three kittens were adopted a few weeks after this photo was taken and Isabelle found her forever home soon after (see bottom photo). Julia, named after Julia Roberts for her red coloring and long legs, came to us (see bottom photo) after a man called saying that his tabby kept bringing her home through his cat door and she was clearly homeless and hungry. We brought her into foster care and soon found out that she was expecting! 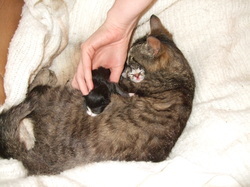 Julia gave birth to two beautiful black and white kittens in foster care (see photos, right) and nursed them for three weeks before developing masitis (an infection of the mammary glands). 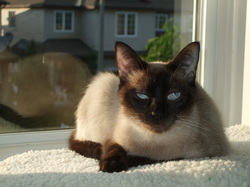 Lucy was found through a woman looking to adopt a Siamese kitten through Kijiji. When the woman met with her contact to pick up her kitten, the woman brought along Lucy as well. 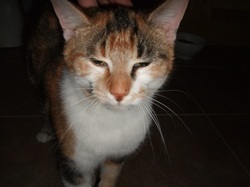 This contact had used Lucy, and most likely many other female cats, to breed kittens and sell them through Kijiji. Lucy had been bred so many times, she was no longer fertile and the contact was trying to get rid of her. 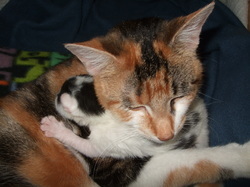 Thankfully, the woman took Lucy home that day as well at the kitten she had been seeking. This woman could not provide Lucy with her forever home so she entered our foster care. 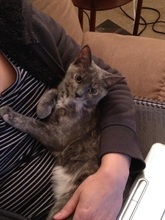 Her foster parents took their time with Lucy as she had clearly never experienced care and affection before. She was most likely accustomed to being in a small space (a cage) as she sought tiny spaces whereever she went. She would jump around nervously when her foster parents would pet her as she had likely never felt a kind touch before. 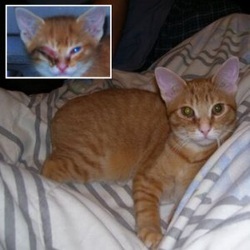 A few months of careful coaxing, Lucy turned into a curious and loving companion. As soon as she was ready, the Cat Rescue Network began inviting potential adopters to visit her and she was adopted shortly after by a patient and caring woman and her son. Lucy is now running around the house, care-free, knowing she is well loved. A man found Olive starving and wandering in a park one day. He brought her home to his small apartment where she lived in close quarters with multiple large dogs and had a few litters of kittens. Being an oriental Siamese, her kittens were popular for a time but the owner had difficulty finding her last batch homes. He ended up calling the Cat Rescue Network when he was forced to move in with his son and could no longer provide Olive with a home. When we picked Olive up, she was timid and shy. Her fosters' home was quiet and larger than the small apartment she was used to, so she quickly came out of her shell and ran around the house meowing and particiating in anything that was going on. Shortly after her arrival, her foster parents discovered that she was pregnant. Olive ended up giving birth to a large and healthy litter of five - all of which found wonderful homes very quickly. Olive watched all of her kittens get picked up by their new owners but only had to wait a short while before her forever family came to get her. She is now living with a brother and sister cat and dog and a very loving forever owner. 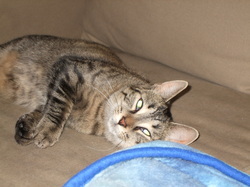 Olive has been fixed and is thrilled to enjoy her life as a safe, young and happy feline - finally. 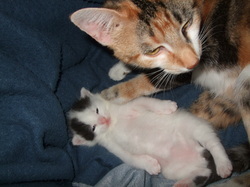 Olive (see above) gave birth to a large litter of six kittens (see below)! 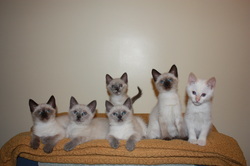 Most of the kittens were adopted before they were even ready to leave their mom - being Oriental shorthair, they were quite the popular little kittens in the Cat Rescue Network. 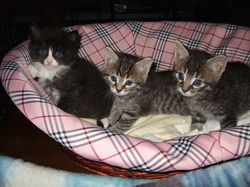 The kittens' foster parents soon learned that Sophia (middle, back), or affectionaly known as "Alien" by her foster parents because she had such large eyes and head when she was born, had a small heart murmur. Thankfully, it is small enough that it will not effect her quality of life. It just means that she may be smaller or have less energy than other cats her age. 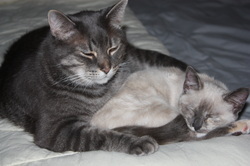 The foster parents had noticed that their permanent cat, Peter, had grown very attached to his foster sister, Sophia. After a long talk, they decided to allow Peter to adopt his new sister, Sophia. Peter, thrilled with his new forever playmate, is very protective of his new sister (above) and even gave up one of his cat boxes for her (below). 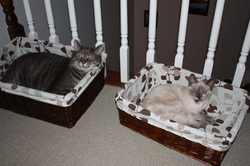 See the attached video for a peek into Smudge and Sage's (two of Olive's kittens) happy new idyllic forever home. Smudge and Sage's foster family was so happy that they were able to be adopted together. 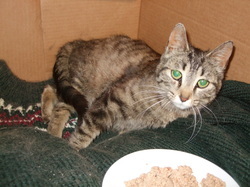 Elsie was discovered living in an old, abandoned garage in Ottawa South with her mother and siblings. A kind and caring woman rescued Elsie and her family in the early fall, just before the weather turned cold and wet. 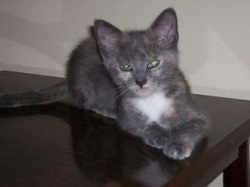 As this woman already had several cats of her own, she contacted CRN to help find Elsie a loving forever home. CRN posted a picture of the eight week old kitten on their website where her adoptive family fell in love with her at first sight. Named after the lion cub in the movie Born Free, Elsie was shy and a little timid when she first arrived at her new home. Having spent the first few weeks of her life in an old garage, she hadn’t had much human interaction. She would often hide behind the furniture until she felt safe enough to come out and explore her surroundings. It didn't take long though for this inquisitive, playful and affectionate little kitten to feel right at home. Now she happily spends her days playing with her adoptive family's three cats and lavishing her owners with lots of purrs and cuddles. To read more about the animals the Cat Rescue Networks have rescued, click on the photos in the listing below and read our blog postings. Do you have a happy tale to tell us about your new friend from Cat Rescue Network? Why not drop us a line, and we will publish it here as soon as we can.